Well the first snow a couple of weeks ago automatically kicked in the winter/survival/ hibernation check down list. It’s a list of things to do before the blizzards come. 7) Put on some extra weight … CHECK … Well at least I’ve got one thing done! 8) Put boat to bed … Yikes is it that time already … Nope! I figure I’ve got 5 weeks if I’m lucky so time to get the boat in some water. I was reminded by the mother of my children that I had not produced a Rainbow dinner in quite some time. My pleas of “ those fish taste muddy out of that lake” “it was too big and wouldn’t have tasted good” “All I caught were Bulls and Whitefish” merely rolled off cold shoulders. So with that not so subtle slap in the face I planned a day on the Peace River. I dumped the boat in a small hole just down below the bridge on the Halfway River. There was just enough water to unload and get the sled up on step before skimming over what looked like wet gravel the 400 yards to the main stem of the Peace. An adrenaline rush at anytime but more so because of the heavy fog. Once out on the big river my heart slowed down and I headed up stream in hunt of some Rainbows. I ended up anchoring the boat in a seam between a big back eddy and the main current. There were fish rising all over the place but they were just little Whitefish. Whitefish make up around 90% of all fish in the river and this summer it seems they were all I was catching, other than some Bulltrout. I’d hooked some Rainbows but these Fish must share some DNA with Kamloops trout as they go airborne fast and often. I lost most of them and they were in the 12-14 inch class. There are bigger ones in the river but they are elusive to say the least. This day started with a VI sink tip and a four inch double bunny that I was casting out into the current and letting swing down below the boat. I was getting hits letting it sit down from the boat so I left it dancing in the current. It appeared they were nailing the rabbit behind the hook as I just couldn’t get a hook up. As I was getting more and more frustrated I looked over beside the boat and there hovering just off bottom in about 10 feet of water was a big Bull! We’re talking in the 3 foot range. I started stripping in line like a Banshee and tried to start casting with too much line which just about got me a rabbit earring. By the time I got that big fly moving in the right direction it had disappeared. I thrashed the water with that wet sock for another 1/2 hour but nothing. 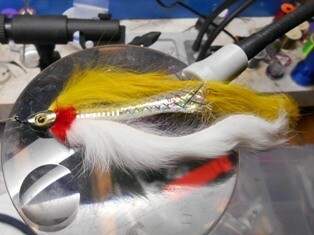 I pulled out the dry line and tied on a deer hair caddis. Might as well get some fun with the little Whitefish. That was okay but not what I had come for. Every now and then, out farther in the current , I’d see a flash of silver and I knew those weren’t Whiteys. The next time I saw the flash I dropped the caddis 10 feet upstream and drifted it through. Bang tug,tug,tug gone. It felt heavy and I started watching and casting farther out. I tagged another one then on the third hook-up all hell broke loose. 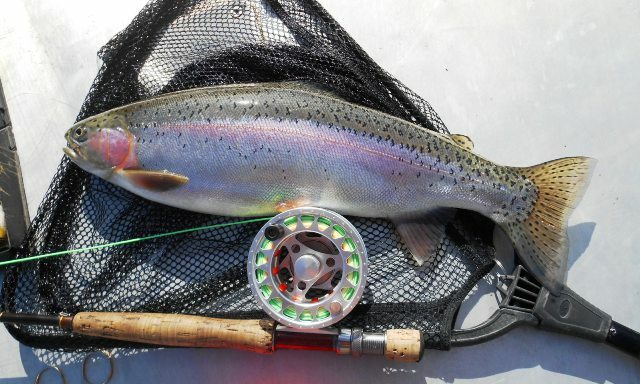 Line peeled off the reel and a big silver slab launched about 3 feet out of the river. That will get the heart beating. As line kept coming off the reel I momentarily thought about pulling anchor but I knew that trying to get the anchor up and start the boat while still maintaining tension on the fish wasn’t going to work. I just hung on and hoped for the best. I got it turned into the back eddy and started to gain some line. Every jump I prayed it wouldn’t throw the hook. Finally got it swimming by the boat and with my nets handle extended all the way out ,scooped it up. Beautiful Rainbow around 3 lbs. There was supper. 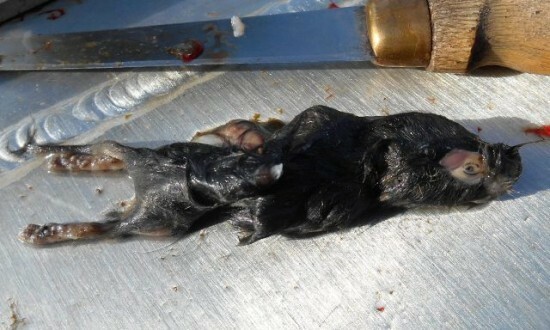 I cleaned it immediately and was surprised to, once again, find a mouse (vole) in its gullet. Fished for a couple more hours and caught some small Bulls and lost another Rainbow. Good day for sure. Tell you what though, I’m digging out some mouse patterns that I use for Bulls on tributaries. Plan on drifting some and see what happens. 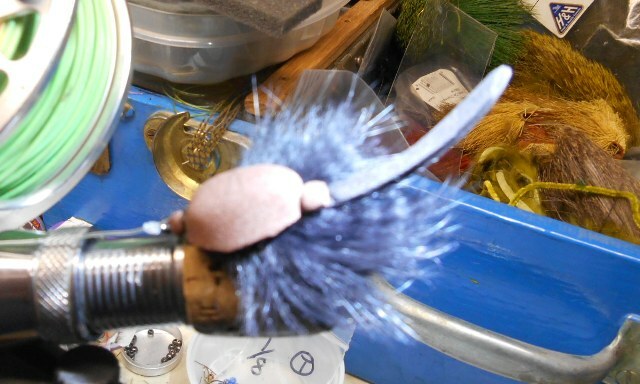 This entry was posted in Fishing Reports and tagged 2014, Fishing, Fishing Reports, fly fishing, Flyguys Northern Division, mouse fly, Northern British Columbia. Bookmark the permalink. Another great read Gord . I was imagining myself in the passenger seat .